Against the Miami Heat, James Harden hasn’t looked like the James Harden we saw in the regular season or the James Harden we saw earlier in the playoffs. Harden has struggled in the Finals, only scoring in double-digits once. Harden’s worst night might have been Game 4 on Tuesday, as he played passively the entire game, especially during a possession late in the fourth that helped seal Miami’s 104-98 win over Oklahoma City. Down by five points with about two minutes left, the Thunder came out of a timeout running a pretty nifty set, one that would have worked if Harden didn’t hesitate. After the basketball gets rolled down the court, Russell Westbrook picks it up and brings it to the middle of the floor. As that happens, the Thunder set a staggered pin-down screen for Harden, with Kevin Durant as the first screener and Serge Ibaka as the second screener. 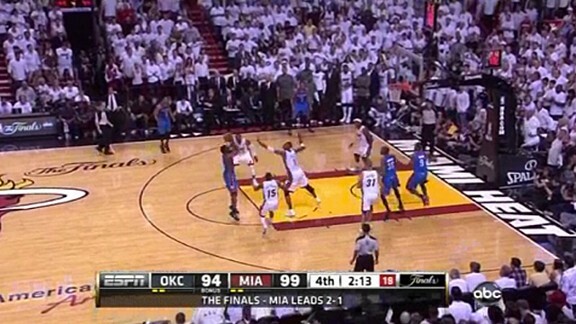 As Harden comes off of Ibaka’s screen, Mario Chalmers, the man responsible for covering Harden, gets sent flying. 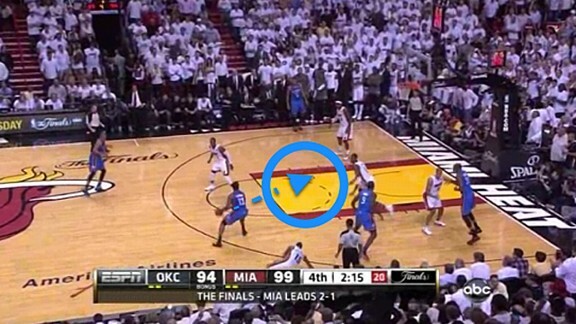 With Chalmers on the floor and nearly out of bounds, the Heat only have two players in position to defend three Thunder players. If the Thunder are aggressive here, they should be able to get an easy look. Before this series, Harden would make this catch, attack the space that is given to him around the free throw line, and make a play accordingly. But on Tuesday night, Harden held the basketball and didn’t attack. Now, that’s also a decent decision, because there is a second option to the Thunder’s play — Kevin Durant, who was coming off of a second Ibaka screen. Oklahoma City was essentially running a double screen for Harden, then a quick single screen for Durant, who curled off it and cut to the rim, getting open for a split second. However, because Harden was so passive when he made the catch, Chris Bosh was able to defend both him and Durant on the cut, backing up just a little bit to take the pass away from Harden. So on a possession in which the Thunder created a lot of space for him, Harden picked up his dribble in almost the same spot where he initially made the catch. The result is a contested jump shot that Harden, who isn’t playing with confidence, fails to knock down. Here is the play in real time. You can see how Harden’s lack of aggression and his hesitation hurts the Thunder. 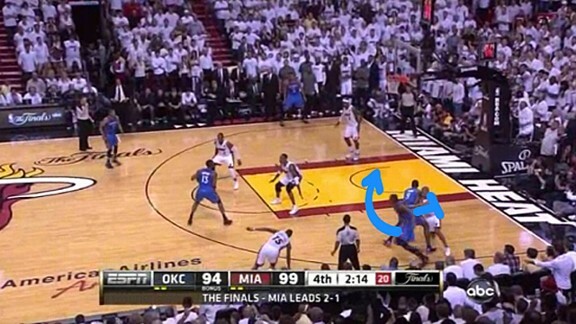 It’s obvious he isn’t attacking because he is waiting to see if Durant comes open off of Ibaka’s second screen, but because he’s such a non-threat with the basketball, he allows Bosh to cover both him and Durant at the same time. The James Harden of old would have made the catch, attacked the space in front of him, and gone from there. 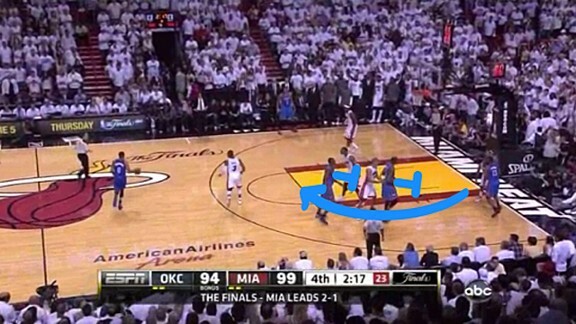 Instead, Harden let two Heat defenders cover three Thunder players on a key possession. 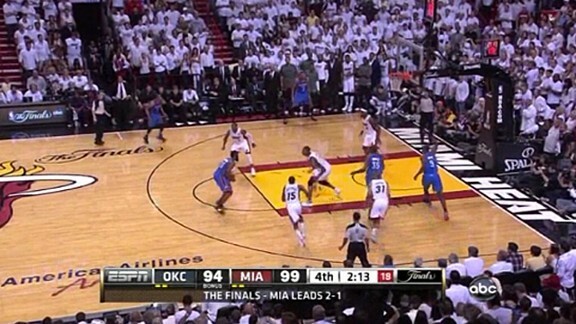 Oklahoma City coach Scott Brooks drew up a great play — it just wasn’t executed, and that hurt the Thunder. With Miami struggling to score late (only two of their remaining five points came from the field) and LeBron James fighting cramps, a made basket here would have put a lot of pressure on the Heat, and who knows what would have happened then.